To get started, you’ll need an angled 8 cm brush. Hold your brush like a pencil, gripping the handle of the brush near the bristles, and keep it vertical so the long edge of the brush is parallel with the wall. If you’re cutting in along a vertical line (such as where your walls and ceiling meet) we recommend you start painting about 5 cm from where the corners meet. 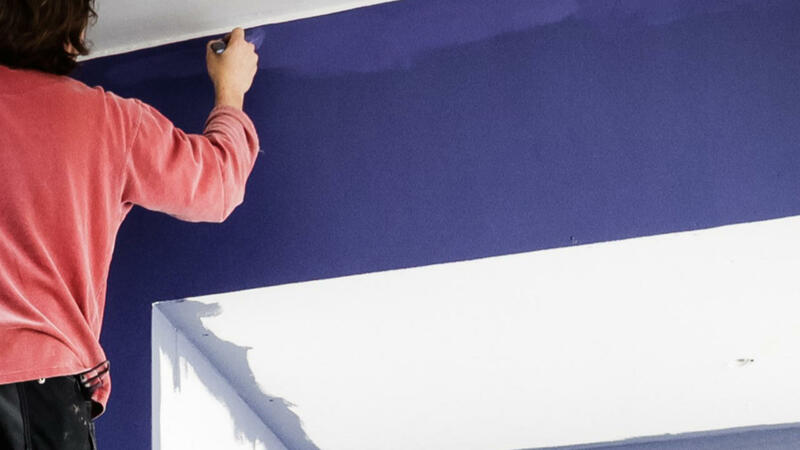 Paint in a single downward stroke along your wall – this will help push the paint from the bristles and create a smooth surface for the brush to glide along. To achieve as straight a line as possible, we recommend painting in short bursts, reloading your brush with just a little bit of paint each time. Try to keep a steady hand and use a light touch – if you squeeze the brush against the wall you may experience pesky paint drips. If you feel like you need a helping hand, apply masking tape along the edges where you’re painting. Just remember to use ‘low-tack’ tape (this can be purchased from hardware stores) and remove the tape before the paint dries. This will ensure the paint doesn’t seep under the tape while it’s drying – and you won’t pull non-masked paint off when you remove it. Remember, it can take a few goes to master the DIY home decor technique of cutting in – but the results make it absolutely worth the effort. To boost your confidence before starting on joining walls, try practising on a piece of board or a cupboard box first. Practice makes perfect!